A bespoke consultancy service – helping you use the cloud to achieve wider digital goals. In research and education, cloud technologies are a key enabler for digital change – making it easier and more flexible to manage a range of digital projects, from essential business services to data analytics to high-performance computing. But integrating the cloud into your vision can bring a wide range of strategic and practical challenges – from making the business case to managing security concerns to designing an effective cloud migration. To help you solve your specific challenges, we offer a bespoke cloud consultancy service, helping make you better equipped to use the cloud to meet your digital goals. Our certified cloud experts offer tailored advice and support, specifically targeted to your needs, and grounded in our experience as a not-for-profit organisation serving the research and education sector. 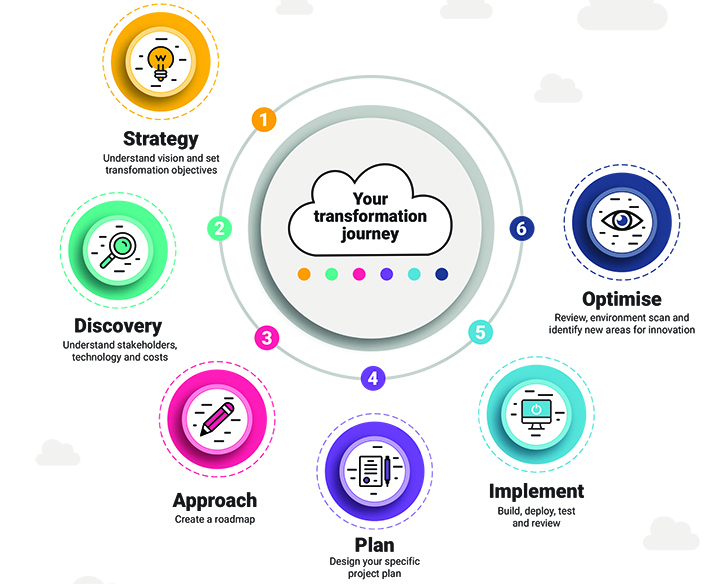 To help you transform and meet wider goals, we help you define your cloud strategy and create roadmaps to put that strategy into practice. Of course, this isn’t something IT can do alone. So we offer workshops for key stakeholders – helping people in the wider organisation understand how cloud technologies help achieve their objectives. A key benefit of the cloud is the chance to become more agile as an organisation ­– managing smaller projects in a more flexible way. We can help you plan for the effect of this cultural change, designing workflows to fit your cloud-first vision. Choosing the right platforms and vendors is a key part of implementing any cloud strategy. At Jisc, we offer vendor-agnostic purchasing frameworks to help you find the best partners to meet your goals; and we work together with platforms and suppliers on specific solutions, creating an ecosystem of partners from which to choose. Cloud solutions offer the chance to reduce capital expenditure and the associated business risk, but it requires planning to realise the benefits. To help you understand the full costs and benefits to you, we recommend a financial assessment such as our financial X-ray as part of your consultancy service. In IT and service delivery teams, it’s important to develop the in-house capability to manage cloud resources going forward. Jisc cloud consultancy is a bespoke service. After an initial, free-of-charge meeting to understand your needs – either face-to-face or as a call – we will write a proposal with defined deliverables for you to approve. When we provide strategic consultancy, this will take the form of workshop days followed by a report with recommendations. We can design other forms of consultancy on a bespoke basis. Our step-by-step guide to making your cloud vision a reality (pdf) shows you how the key steps works in practice and how our consultancy team can help you. For a more in depth look at moving to the cloud and what each step could involve, see the cloud strategies and roadmaps presentation by Josh Fry, enterprise director at Jisc. To find out more about this or our other consultancy services, contact your account manager.